Royaumes de Perse Herat & Kaboul Confed.on des Baloutchis Principaute de Sindhy Conf.on des Seikhs ou Roy.me de Lahore et la partie la plus peuplee du Turkestan Independ. 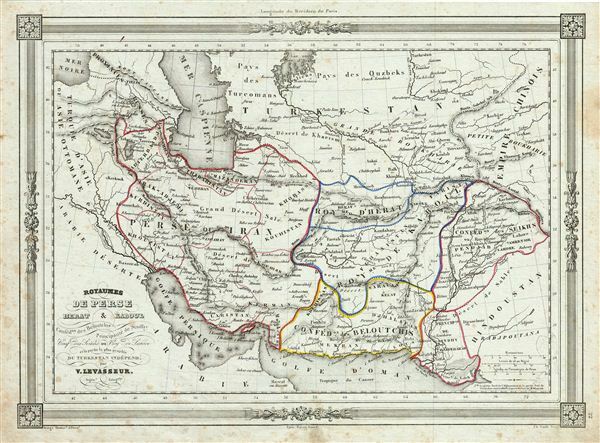 An uncommon and extremely attractive 1852 map of Persia by Victor Levasseur. Set between the Caspian Sea and the Persian Gulf, this map covers all of modern day Iran and Afghanistan as well as parts of adjacent Pakistan, India and Iraq. Throughout, the map identifies various cities, towns, rivers and assortment of additional topographical details. Persia at this time was controlled by the powerful Qajar Dynasty of Shahs. The map features a beautiful frame style border. Prepared by Victor Levasseur for publication as plate no. 22 in Maison Basset's 1852 edition of Atlas Illustre Destine a l'enseignement de la Geographie elementaire.